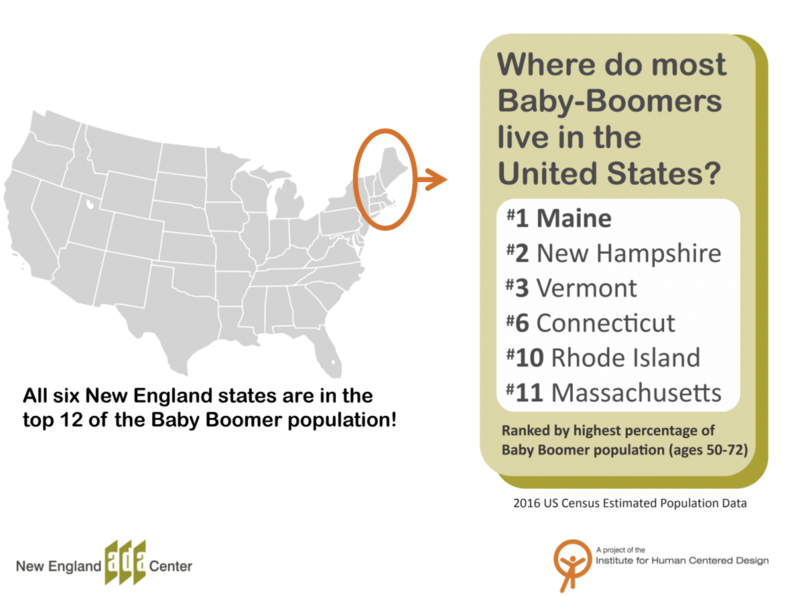 Findings show the New England region has highest percentage of baby boomers in the US (ages 52-70). Find out how your state ranks, open our Where do most Baby-Boomers Live PDF. Startling findings show the largest percent of adults with disabilities (age 18+) have: upper body limitations, mental disabilities, and use canes/crutches/walkers. The smallest percent of adults with disabilities have difficulties hearing, seeing, and use wheelchairs. Find your state, city and sub-group. Open our Data on Disability in States, Cities and Sub-Groups PDF! 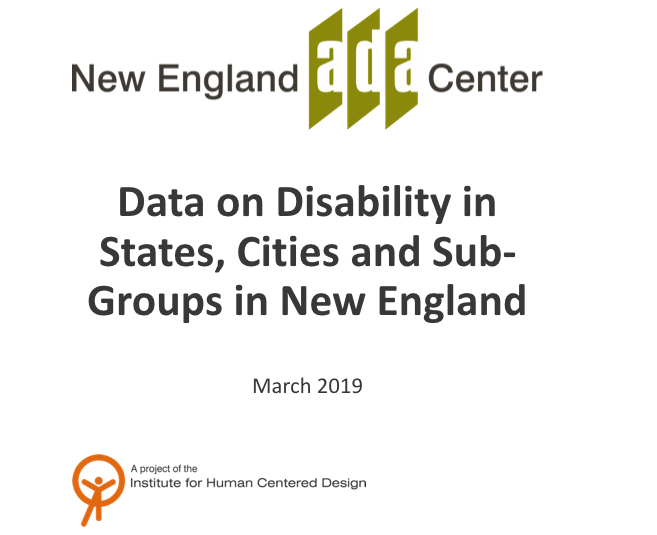 To read the full research report for New England as a whole, and for each state by disability and: age, gender, race and socioeconomics, open our Examination of Disability PDF. The following refereed publications are the results of cooperative research efforts between the New England ADA Center and Drexel University's Center for Labor Market Policies from 2006-2011. 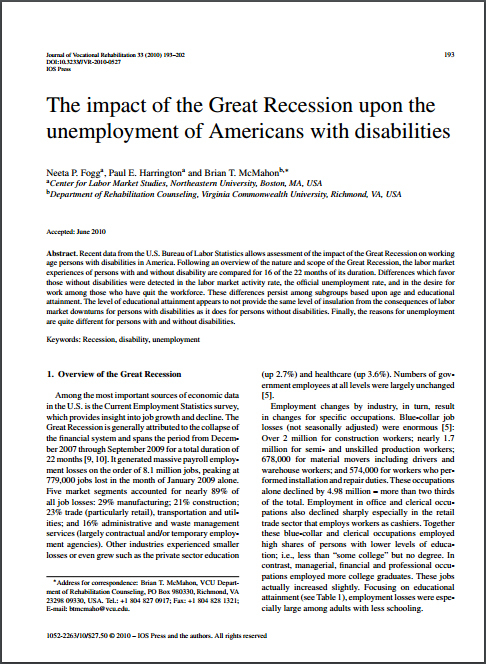 Recent data from the US Bureau of Labor Statistics allows assessment of the impact of the Great Recession on working age persons with disabilities in America. Following an overview of the nature and scope of the Great Recession, the labor market experiences of persons with and without disabilities are compared for 16 of the 22 months of its duration. Differences which favor those without disabilities were detected in the labor market rate, the official unemployment rate, and in the desire for work among those who have quit the workforce. These differences persisted among subgroups based upon age and educational attainment. Finally, the reasons for unemployment are quite different for persons with and without disabilities. Our research found that community colleges appear to enroll disproportionately large shares of students with disabilities. To meet the challenge of increasing the number of associate degree awards, new organizational designs, programs and incentives are needed to increase retention and graduation of students with disabilities.